The Tuareg are an Islamic people who dwell in and around the SAHARA DESERT. They speak Tamacheq, one of North Africa’s Berber languages. 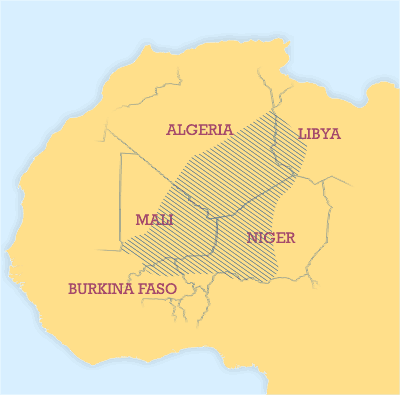 Numbering about one million people altogether, Tuareg can be found mainly in MALI and NIGER but also in BURKINA FASO, ALGERIA, and LIBYA. Descendants of the nomadic BERBERS, North Africa’s original inhabitants, the Tuareg appeared first in Libya and spread into regions bordering the Sahara. They incorporated local farming peoples into their society, sometimes trading with their neighbors, sometimes raiding them for slaves. Tuareg culture has several distintive features, including a custom that requires men to veil their faces and a religion that blends traditional beliefs and rituals with Islam.